About Pilgrim’s Professional Roof Repair Experienced Roof Repair Company Thank you for your interest in Pilgrim’s Roof Repair Service! Our family business has served the Michigan Downriver, Southeast, and metro areas, along with the West and Northwest suburbs for over 35 years. We look forward to the opportunity of serving you as your residential roof repair experts. Our success has been the result of deep, core business values that have not changed since the beginning. These business values were implanted by Butch Pilgrim, Sr., when he originally established his familie’s roof repair business. His core beliefs are that extraordinary customer service is the focal point for a business’s longevity, and these beliefs have driven the company ever since. 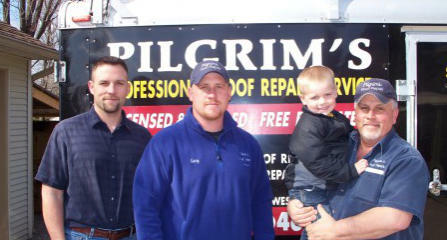 At Pilgrim’s Roof Repair Service, we believe that the extraordinary customer service is a combination of unrivaled professionalism, pride, unsurpassed quality and workmanship, but most importantly, “total customer satisfaction." Our professionalism is second-to-none. Our customers are pleasantly surprised when the “Roof Repairman” that visits their home is a uniformed and educated expert. We are widely recognized throughout the roofing industry in both the residential and commercial markets as specialists in roof repairs. In fact, many of our most loyal customers are full-service roofing companies that place high value on our services, to team along with them on challenging projects. Our pride is deeply rooted. We are proud of our success, and we do not accept being out-performed by anyone. Our vehicles are the cleanest on the roads, and our tools and equipment are industry-best. Our quality and workmanship are unrivaled. We would not know how to cut a corner if we tried. We are committed to providing long-lasting, permanent repairs. In fact, most of our repairs are guaranteed for the life of your current roof. We constantly hear our customers’ stories explaining how some of our competition only guarantees their roof repair work for 30 days or less. These 30-day repairs are mostly “tar” jobs, where a repairman would coat the leaking area of your home with a thick layer of black tar with hopes to stop the leak. We don’t believe in using tar, because tar represents a “temporary” fix. We believe in permanent solutions. The materials that we use for our repairs are industry leading (25-Year Lifetime Warrantied) and best. The bottom line… you will never find a bucket of tar in our toolbox. Total customer satisfaction is our vision for every contract we sign. We are committed to deliver on our promises to service your roof with full professionalism and unrivaled quality. We have achieved our high quality through the years by maintaining a relatively small, expert staff, with combined roof repair experience of over 55 years.